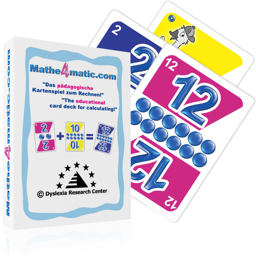 Mathe4matic "The educational card deck for calculating"
This innovative new card game helps children with numeracy problems. The concept behind it is amazingly simple: counting with cards. Produced by the renowned Viennese playing card firm ‘Piatnik’, the cards use fun games to help in the learning of figures, quantities and basic arithmetic. The deck is made up of four sets of colored cards numbered from 1 to 12, and also four Jokers which can represent the four basic arithmetical symbols.